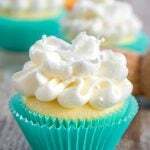 Mimosa Cupcakes - Orange Cupcakes Topped w/Champagne Frosting! 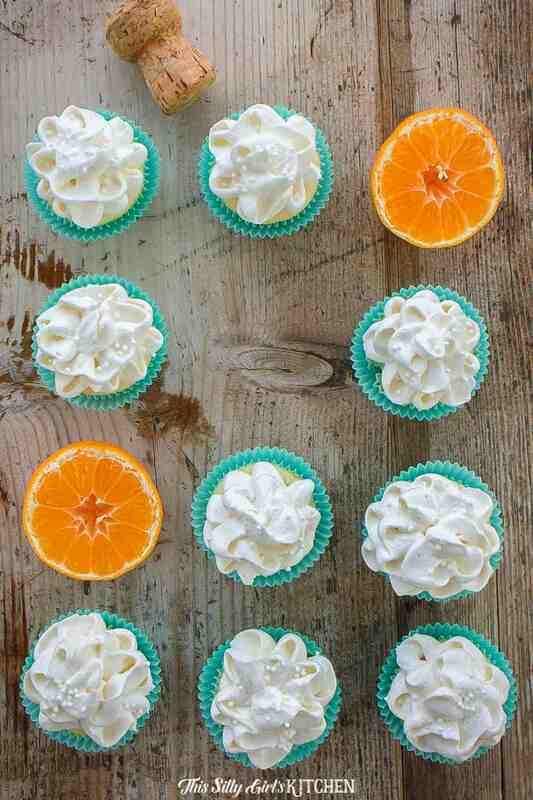 Mimosa Cupcakes - Orange Cupcakes Topped w/Champagne Frosting! 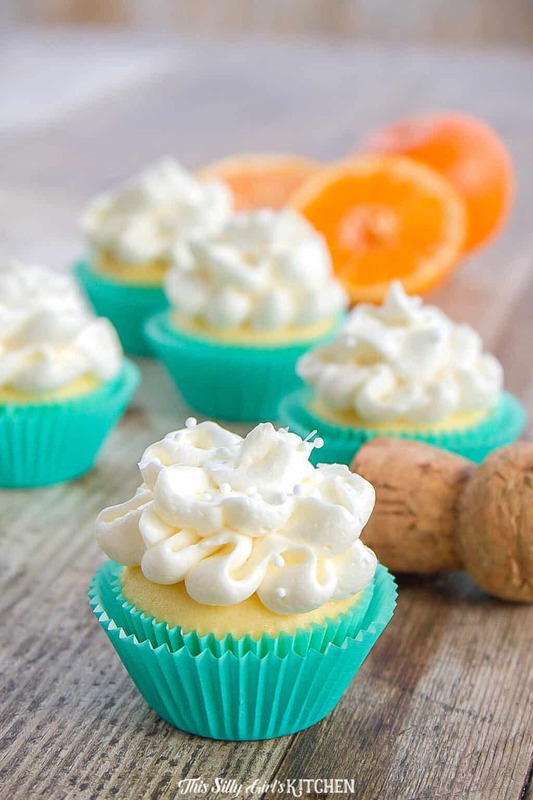 Mini Mimosa Cupcakes, bite-sized cupcakes infused with fresh squeezed orange juice and topped with fluffy champagne buttercream frosting! 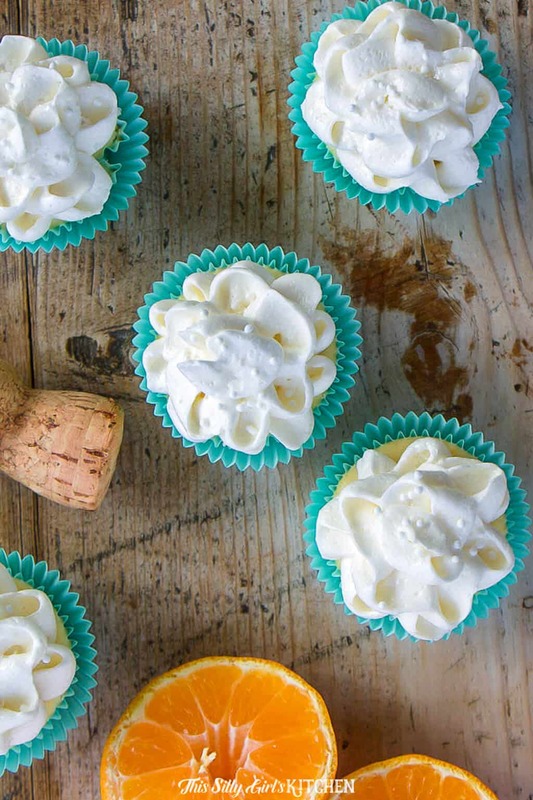 Mimosa cupcakes – easy, from scratch, and perfect for brunch. Okay, okay, now I know I’ve said this a thousand times BUT…. these HAVE to be the best cupcakes I have ever made. I know. Trust me on this, these little cuties are just bursting with mimosa flavor! How adorable will they be on your holiday brunch spread OR at a New Year’s Ever party…. swoon. 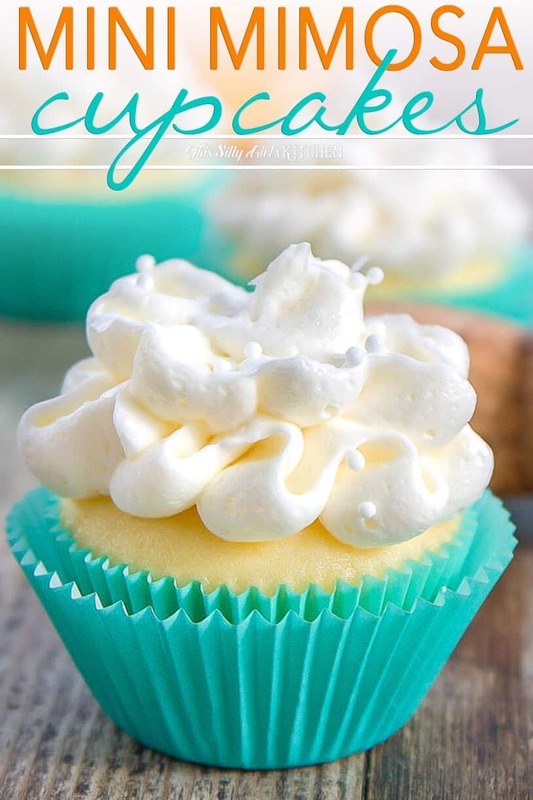 These are soooo easy to make too, I used a boxed white cake mix, like usual. I juiced those mini Halos mandarin oranges for the liquid in the cupcakes and wow, they are really bursting with sweet orange flavor! Also, I got the recipe inspiration for the frosting from Gimme Some Oven. Preheat oven to 350 degrees. Fresh squeeze oranges for 1 cup of juice. Mix juice with the rest of the ingredients with a hand mixer until combined. On medium speed, mix for another 2 minutes. Fill mini cupcake tins lined with wrappers 2/3 of the way full. Bake 10-12 minutes until a toothpick inserted in the middle comes out clean. Place on a wired rack for 5 minutes, and then transfer cupcakes directly on to rack. Cool completely. Top cupcakes with frosting and sprinkles, if desired. Serve and enjoy! 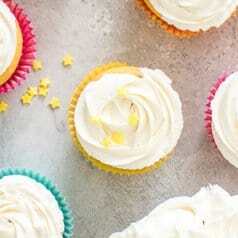 Please, please try these mini mimosa cupcakes! Even if you think you don’t like champagne, these are just amazing. The alcohol flavor is verrrry subtle but they taste just like the best mimosa! 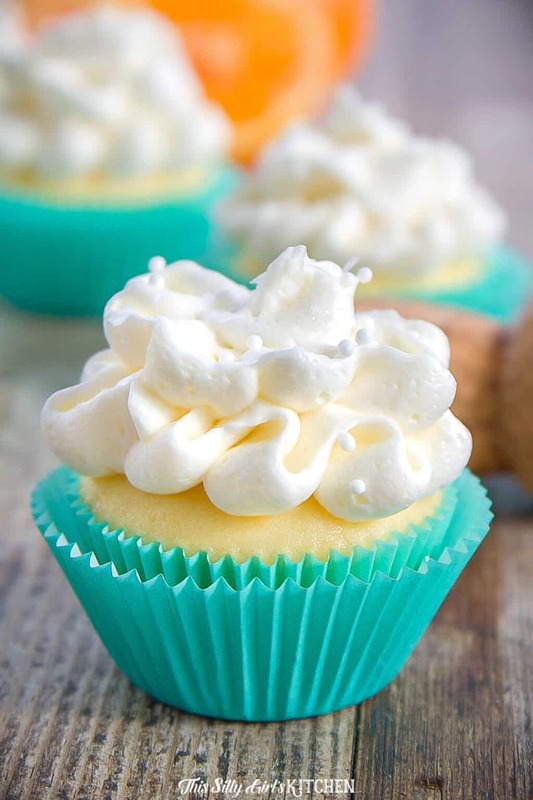 Bite sized cupcakes infused with fresh squeezed mandarin orange juice and topped with fluffy champagne buttercream frosting! Preheat oven to 350 degrees. Mix juice with the rest of the ingredients with a hand mixer until combined. On medium speed, mix for another 2 minutes. Fill mini cupcake tins lined with wrappers 2/3 of the way full. Bake 10-12 minutes until a toothpick inserted in the middle comes out clean. Place on a wired rack for 5 minutes, and then transfer cupcakes directly on to a rack. Cool completely. Cream together the butter and sugar with a hand mixer on medium speed. Add in the remaining ingredients and whip on high speed for two minutes until light and fluffy. 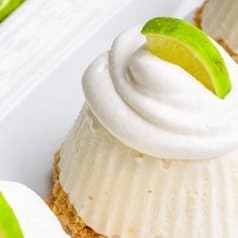 Key Lime Pie – Mini No Bake Pies! These look absolutely delicious! Anything involving champagne is good in my book. I love mimosa! These look absolutely amazing! These look amazing! Pinning! Thanks for sharing on Six Sisters Stuff! I would love to serve these at New Year’s or any brunch party! Pinning for future reference – thanks for sharing! These look so seriously tasty. Yum! Made my way here via the Busy Monday linky. Thanks for sharing! If you get a chance to stop by my blog sometime, I’d love it! These look amazing! Thanks for sharing on Show Me Saturday! GIRL…STOP IT! These look amazeballs and I don’t need to be making any more of your recipes. 😉 Thank you for linking this up at Snickerdoodle Sunday- hope you’ll come back later this week with your latest makes! oh yeah i would eat a few of these for sure! I love those little halos so having them in a slightly less messy form of a cup cake (hey I am experienced at messy eating lol) would be so delish!! love this! Oh my goodness! 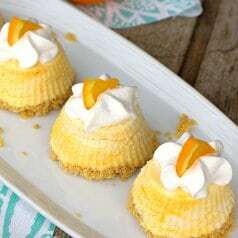 Mimosas are my favorite, I will definitely have to try baking these!! I love citrus flavored treats in the winter.. they make me think of summer. Pinned. Thanks for sharing this with us on Weekend Bites. Looks so yummy & love how easy they are to make! Happy holidays Dana! Hey there Dana, those cupcakes looks good and sounds good too, I’d love to give them a try! 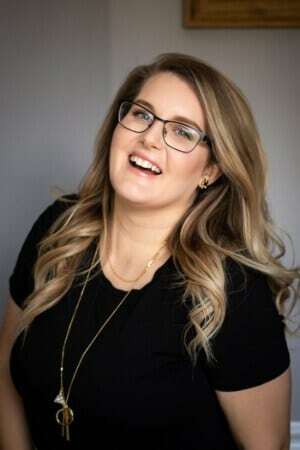 I’m Louise Douglas with A Gainesville mom writes, and one of the newest co-hosts on Wakeup Wednesday linky, and I’m just stopping by to say congrats for being featured on this weeks linky! I have met some pretty amazing women behind a blog while co-hosting, and I’m thankful that I decided to give it a try because I may have never met you all if it wasn’t for the linky party! I want to wish you a Merry Christmas, and you are so amazing that I’m your newest follower on pinterest, twitter, and + google! you rock! I made these for my new job to share with the girls and they were a huge hit! I made a couple of changes/additions but mostly kept it the same and everyone wanted the recipe. Definitely gonna have to make these again soon. Yay! I’m so glad you liked them, and thanks for letting us know! I made these tonight and brought them to a rehearsal: everyone RAVED about them! The only difference I made was substituting melted butter for vegetable oil. Someone said they were heavenly and on a totally different spiritual plane than us haha. Amazing recipe!! WOW! LOL, never heard that one before but I’ll take it! Thanks so much!! I made these for a girls’ night, and they were devoured. Only change I made was to unsweetened applesauce in place of vegetable oil. I also topped the cooled cupcakes with some of the champagne, before frosting them, and garnished the frosting with orange zest.